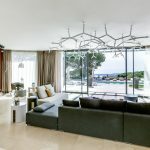 If you are looking for that true wow factor in a luxury Cannes villa, look no further than the elegant Villa Megan. 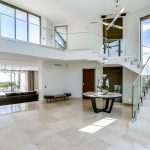 A true masterpiece of contemporary architecture, this stunning villa offers absolute luxury and stunning views. Enjoying an enviable location in a premier residential area of Cannes, Villa Megan is set on 6,500 square meters of beautiful land. Architecturally designed and stunning decorated, it is a truly exceptional south-facing villa in Cannes. Prepare to be wowed from your first glimpse at the clean lines and natural textures of this contemporary property. Step inside and admire the opulent flooring and floor-to-ceiling windows that allow natural light to flood into the property. The end result is a property that feels opulent and expansive yet inviting. There are a number of indoor shared living spaces, including an open living, dining and kitchen on the ground floor. Downstairs, you’ll find a cinema room, as well as an elegant wine tasting room and a wine cellar for enjoying your favorite varietals. The living area opens out on the undercover terrace, which is an inviting place to enjoy an alfresco meal or perhaps entertain friends and family. From this deck, you can enjoy the sight of palm trees and the sea out in the distance. Not far away, there is a relaxing jacuzzi to enjoy. Take just a few more steps and find yourself on the wooden pool deck, where the glittering heated swimming pool tempts you to dive in. Numerous sun beds dotted around the pool are perfect for enjoying lazy days taking in the Cannes sunshine. At the conclusion of each wonderful day in Cannes, retire to one of the property’s seven bedrooms. Three of the bedrooms are spacious and elegant with their own ensuite bathrooms, while the fourth beautiful bedroom has a shower room. A particular highlight is the expansive master bedroom, which features its own private lounge room and ensuite. There is also a self-contained caretaker’s cottage with two bedrooms and a shower room. The property has three undercover garages for your convenience, and there is a video surveillance post and alarm system for your peace of mind. The location is private yet convenient, close to the bustling city center but also within easy reach of the coast.